The 1st Conference of the Comparative Social Research Network (CSRN) will be held at Ito campus, Kyushu University on January 27-28, 2018. This conference aims to promote cross-country and cross-regional comparative research in social science. 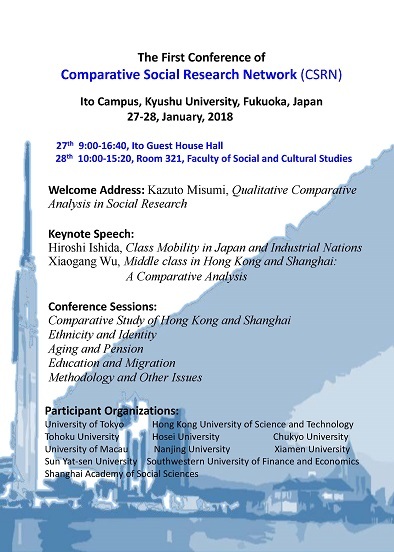 Scholars from 12 institutions in Japan, Mainland China, Hong Kong, and Macau will be gathering together to exchange their ideas on comparative social research. Presentations and discussions will address areas such as social mobility, education, migration, methodology, and health. Prof. Kazuto Misumi from Kyushu University will give opening remarks. Prof. Hiroshi Ishida from the University of Tokyo and Prof. Xiaogang Wu from the Hong Kong University of Science and Technology will deliver keynote speeches. This event was co-organized by Prof. Kazuto Misumi, Dr. Shuanglong Li (Visiting Scholar at Kyushu University, Associate Professor of Sociology, Southwestern University of Finance and Economics), and Dr. Jun Li, Deputy Director and Associate Research Fellow, Institute of Sociology, Shanghai Academy of Social Sciences). This conference is open for anyone who is interested in comparative social research. The conference program is available below.